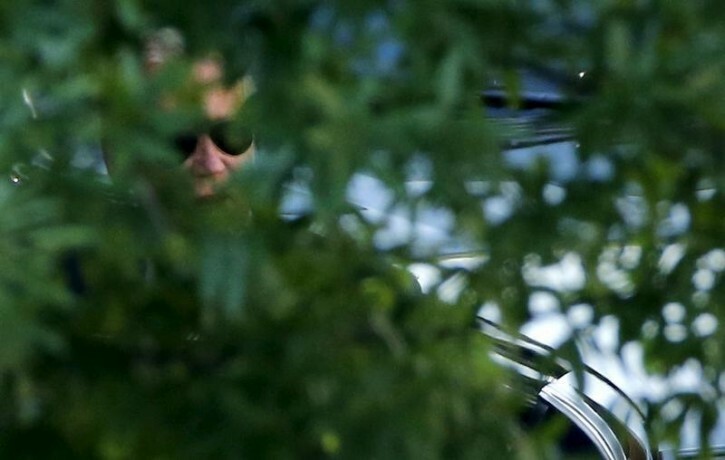 U.S. Vice President Joe Biden (C) can be seen through trees as he arrives to attend the presidential daily briefing at the White House in Washington August 24, 2015. Washington - Vice President Joe Biden, in his first publicly aired comments on a possible presidential candidacy, told fellow Democrats on Wednesday he was trying to decide whether he could give “my whole heart and my whole soul” to a run for the White House. In a conference call with Democratic National Committee members in which Biden also discussed the Iran nuclear deal, he said: “We’re dealing at home with ... whether or not there is the emotional fuel at this time to run,” according to CNN, which said it gained access to the conversation. “If I were to announce to run, I have to be able to commit to all of you that I would be able to give it my whole heart and my whole soul, and right now both are pretty well banged up and we’re trying to figure out that issue,” Biden said in an audio clip aired by CNN. Biden’s eldest son, Beau Biden, a former Delaware attorney general, died of cancer in May at age 46. It was another family tragedy for the vice president, who lost his first wife and his daughter in a car accident shortly after first winning election to the U.S. Senate from Delaware in 1972. Biden has been huddling with senior advisers to evaluate options for taking on former Secretary of State Hillary Clinton, the front-runner in the race for the 2016 Democratic presidential nomination. She has struggled to overcome fallout from her use of a private email server while working as the nation’s top diplomat. Speculation that Biden might run ratcheted up on the weekend when he met with Massachusetts Democratic Senator Elizabeth Warren, a power broker among liberals. She added that “he should have the space and opportunity” to decide what he wants to do. What about your heart and soul to lead the the country for the next 4 years?! That doesn't matter, all that matters is whether or not you can win.. The answer to my question is a clear no. Not you or Hillary have the capacity to give their heart and soul to this country. Vote Trump! What about your brain? You have not given that to being Senator or Vice President. Please Mr. Vice President ....Don't waste your $$$ ,& energy .Do us all a favor ....Retire !!!! This is shades of Ross Perot. He's trying to create a demand for him to run. It's nothing but a con job.